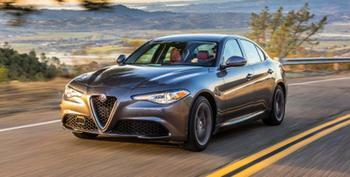 Chrysler (FCA US LLC) is recalling 6,136 model year 2017-2018 Alfa Romeo Giulias equipped with GME 280HP engines and All Wheel Drive. The brake fluid line may contact a coolant hose clamp, possibly causing brake fluid to leak onto the exhaust and increasing the risk of a fire. Chrysler will notify owners, and dealers will install a bracket on the brake fluid line to prevent contact with the coolant hose clamp. If damage is found on the brake line, it will be replaced, free of charge. The recall is expected to begin January 15, 2019. Owners may contact Chrysler customer service at 1-800-853-1403. Chrysler's number for this recall is UB9.